The servers that house this website are maintained in a manner that safeguards the information in our databases effectively. In particular, when you contribute online, the transaction is processed using encrypted code on a secure donation site, such as paypal or others, on a secure and dedicated web server. The personal information that is requested is the same that we would request for donating through the mail. We do not retain records of contributors’ credit card numbers. Daily Herald I am honored to have your endorsement. So many work so hard. Thank you. 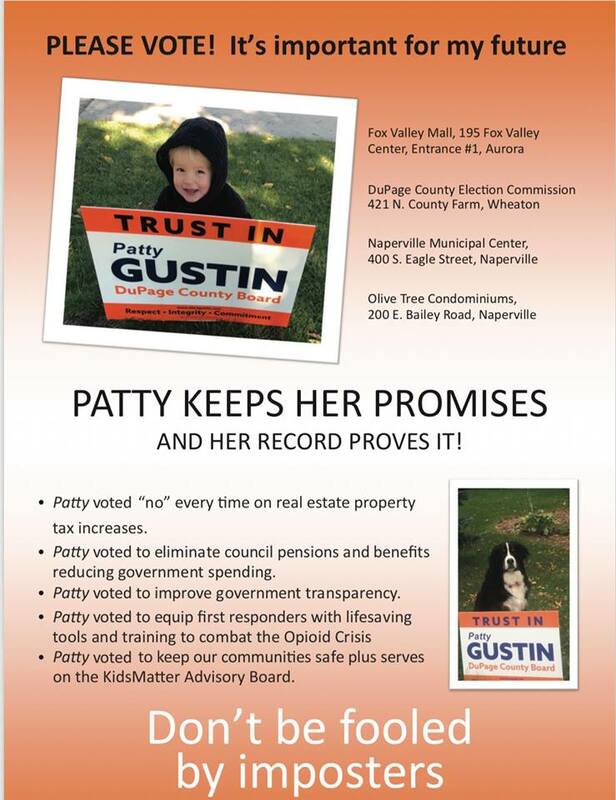 Please help get Patty Gustin elected to the Naperville City Council. Why Vote for Patty Gustin? As my supporters and I speak with local voters in Naperville, voters want to know WHY they should vote for me for Naperville City Council. I believe the reasons are clear. It’s because of my experience, service, volunteerism and principles, objectives and positions on major issues important to our community, many documented on my website at www.electgustin.com and www.Facebook.com/electpattygustin. • EXPERIENCE THAT WORKS FOR YOU. City Councilwoman – Responsible for a 400,000+ million-dollar balanced budget while providing services such as police, fire, and ambulance, libraries, transportation and parking (snow removal and paving) utilities (water, sewer & electric), economic development, permitting and construction and general well-being of residents. • Dupage Mayors & Managers Conference – Monitors county-wide activities & legislation and fosters intergovernmental cooperation. • Sister City Liaison – offers a greater understanding of lasting friendship between the people, including opportunities for cultural exploration; providing economic development and trade opportunities; opening a dialogue that addresses mutual issues, and developing partnerships through which we can creatively learn, work and solve problems together. • Kids Matter Advisory Board – Building resilient kids who say No to destructive choices and Yes to endless possibilities. 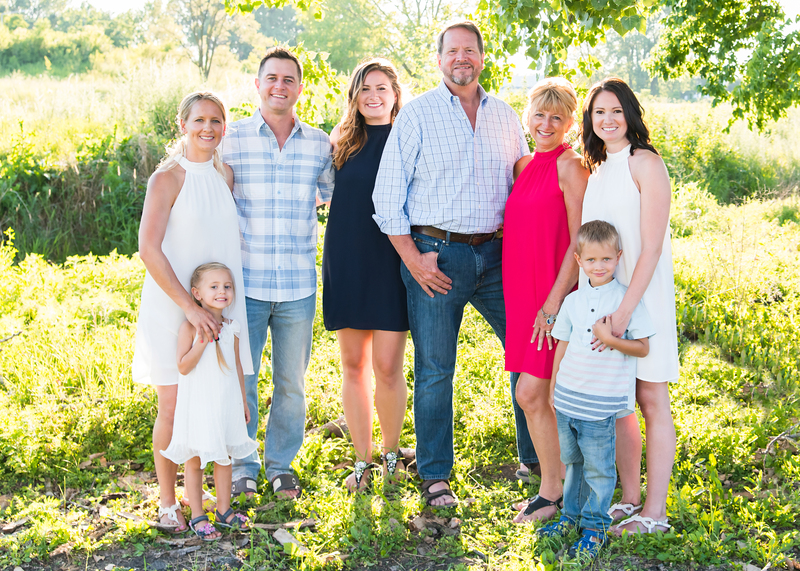 • Naperville Responds for our Veterans – Assisting Veterans and their families with low and moderate income, by raising donations for building materials and professional labor to repair, build and donate homes for our Veterans. • Planning and Zoning Chair – Almost 18 years of volunteer service in oversight of Dupage developments. • Dupage Realtor – Understands the importance of government and its effect on your biggest investment your HOME. I humbly ask for your vote. It is important to have a candidate who loves Naperville and who is running for the right reason, has put time and energy into making Naperville a place my voters want to live. Where respectful representation is a must. Only together can we make sure our voices are heard and have representation on the City Council. Please help by voting for me on April 2, 2019!